Once you've parked & unloaded your vehicle, proceed to take the courtesy shuttle to the terminal. Transfers run every 10 minutes and transfers take approx. 7 minutes. When you arrive back from your trip, follow in-terminal signs for Buses to the Mid Stay car park. Courtesy buses are located at the bus stop in front of the terminal. This car park has the ParkMark Award. Car park is manned 24hrs, frequently patrolled and enclosed by security fencing. Comprehensive CCTV in operation. 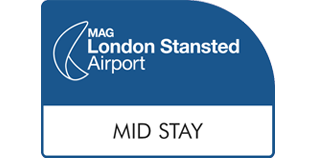 Stansted Airport Mid Stay is an official park and ride service just 7 minutes from the terminal. It's ideal for stays of three days or more.